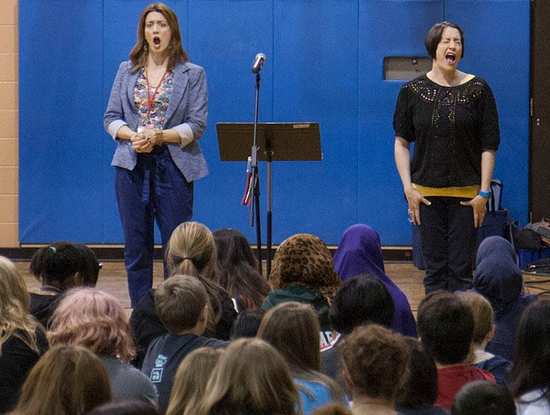 Two of Minnesota's best music-theater actors just happen to be sisters: Christina Baldwin and Jennifer Baldwin Peden. Both are incredibly talented and appear in everything from opera to musicals to plays, with theater companies all over town. If either one of them is in a show, it's guaranteed to be good, so the two of them together is double the thrill! I haven't seen them perform together since my favorite Guthrie show ever, Pirates of Penzance, in which Jennifer played Mabel and Christina played her sister, naturally. So I was not going to miss an opportunity to watch a free performance with the two of them at St. Paul's beautiful Landmark Center. They presented a version of the program that they do in schools called Opera Demystified. I am a musical theater geek, but I can count the number of operas I've seen on one hand, so this was a great education for me as well. And it really makes me want to see more opera (who needs a night off?). Jennifer and Christina started the show with a medley of opera "hits," familiar even to an opera novice such as me, which proves that opera is a part of our popular culture. They then launched into an interactive mini history of opera, complete with dates, facts, musical snippets, and silly made up statements by Jennifer, sure to entertain kids (and adults). True to the title of their program, they make opera completely accessible, understandable, and enjoyable. Some of their lessons include singing "Wrecking Ball" in an operatic style to demonstrate that opera is not appropriate for every song and situation, explaining that vibrato was developed to help singers be heard over the orchestra before the days of amplification (thanks, electricity! ), and translating well known pieces into English to show that opera really is telling a story. As sisters, Christina and Jennifer have such a great rapport and are quite amusing to watch, in between blowing the audience away with their gorgeous voices. The Baldwin sisters have a bit of help with this program, including Steven Stucki on piano and audience plant Aaron Larson, whom they brought up on stage and pretended to teach about opera, until he began to sing and it was revealed that he's an accomplished opera singer himself. Skylark Opera sponsors Opera Demystified, and also hosts a summer festival which I've attended for the past few years. Jennifer and Christina will both be performing in this year's festival, and gave us a little taste of what we'll see at Concordia University's E.M. Pearson Theatre in June. Jennifer will be appearing in Leonard Bernstein's Candide (which I've been wanting to see since getting a taste of it at a Broadway Songbook last year), and Christina in From Berlin to Broadway, featuring the music of Kurt Weill. In addition, two other songs featured in the history lesson are operas you can see locally in the coming weeks. The Gershwins' Porgy and Bess is coming to the Ordway at the end of March, and Frank Theatre is doing The Threepenny Opera in April. If you work with a school (high school, middle school, or elementary) and are interested in exposing the students to the arts, I highly recommend you contact Skylark Opera to inquire about the Opera Demystified program. It's highly entertaining and educational, and guaranteed to create a few new opera fans. It worked for me!